(A) Multiple erythematous to purple-colored papules on presentation. (B) Interval decrease in size and pigmentation of papules on day 9 of induction chemotherapy. 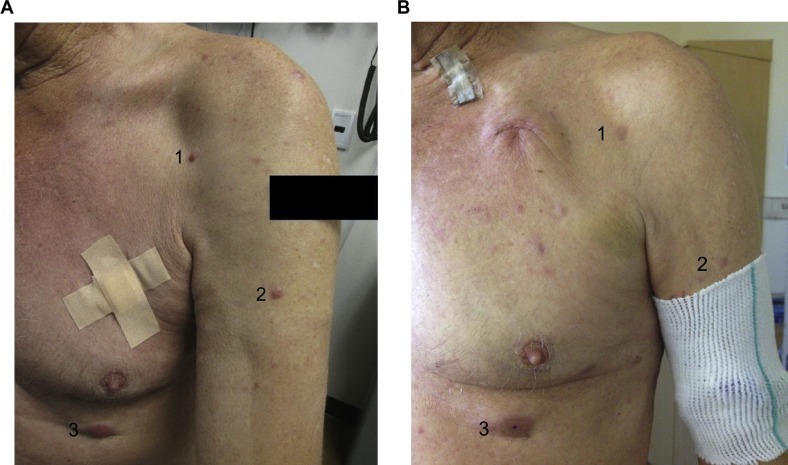 A 73-year-old white gentleman with a medical history significant for stage IIA (pT3a, N0, M0) malignant melanoma managed by wide local excision from his right shoulder was referred to our cutaneous clinic for evaluation of locally recurrent disease. An excisional biopsy of the lesion 3 months prior had been interpreted as consistent with malignant melanoma, spindle cell type, with an invasive component and positive margins. Immunohistochemical staining was negative for pankeratin, desmin, HMB 45, and Melan A, yet positive for S100, supporting the assigned diagnosis. Positron emission tomography/computed tomography imaging ordered for staging reported no evidence of focal hypermetabolic activity but did note splenomegaly and diffuse enhancement throughout the skeletal system consistent with marrow stimulation. During his follow-up appointment to review the imaging, his examination revealed an interval appearance of multiple painless, nonpruritic erythematous nodules on the torso and arms. He denied any associated constitutional symptoms (eg, fevers, night sweats, unintended weight loss, excessive fatigue). Three years prior to presentation, he had undergone an extensive workup for thrombocytopenia and leukocytosis. This included a bone marrow biopsy that was negative for malignancy or myelodysplastic syndrome. The patient was otherwise healthy and active. On examination, there were multiple subcentimeter erythematous to purple-colored papules on bilateral shoulders, left arm, and left chest (Figure 1A), as well as two 3-cm, flesh-colored, solid nodules on the left forearm. His white blood cell count was 12 k/uL, hemoglobin 14 g/dL, and platelets 70 k/uL. Biopsy was an initial step in his workup given his recently diagnosed recurrent malignant melanoma. Primary differential diagnoses at this time included malignant melanoma, leukemia cutis, myeloid sarcoma, and cutaneous lymphoma. A biopsy of one of the new lesions was obtained, and pathologic analysis was consistent with myeloid sarcoma with immunohistochemistry positive for CD45, vimentin, CD4, CD43, CD56weak, and CD68, yet negative for CD34, CD117, AE1/AE3/Cam5.2, S100, CD123, CD3, CD20, TdT, and TCL1 (Figure 2). Immunohistochemical stains were strongly positive for CD45, vimentin, CD4, and CD43; weakly positive for CD56; and cytoplasmic granular positivity for CD68. Bone marrow biopsy showed trilineage hyperplasia with 80% cellularity, a few abnormal megakaryocytes, and no blasts. FISH and cytogenetics on bone marrow aspirate were negative for myelodysplastic-related changes; however, a diagnosis of low-grade myelodysplastic syndrome was favored. There was no marrow involvement of acute myeloid leukemia. The patient was diagnosed with secondary myeloid sarcoma, as his bone marrow biopsy demonstrated subtle changes consistent with myelodysplasia. Myeloid sarcoma is a rare, extramedullary manifestation of acute leukemia that occurs in about 2%-8% of patients with acute myeloid leukemia.1 It is also known as granulocytic sarcoma or chloroma. It can manifest in a variety of tissues, such as bone, soft tissue, skin, gastrointestinal, lymph nodes, and other less common sites. This can occur concomitantly with acute myeloid leukemia or myelodysplastic syndrome, as a sign of relapsed acute myeloid leukemia, or rarely, preceding acute myeloid leukemia.2 The present case is one of myeloid sarcoma in a patient with minimal myelodysplastic changes who subsequently developed acute myeloid leukemia after induction chemotherapy. Treatment for myeloid sarcoma is dependent on the status of leukemia, such as whether the disease presents at the time of initial leukemia diagnosis, as relapsed disease, or as isolated myeloid sarcoma.2 In cases of isolated myeloid sarcoma with no bone marrow involvement, delayed or inadequate treatment will progress to acute myeloid leukemia in about 75% of cases.4 This patient was treated with induction chemotherapy using CLAG-M (cladribine, cytarabine, filgrastim, and mitoxantrone). On day 9 of therapy, he had complete resolution of the flesh-colored nodules on his forearm and drastic improvement in papules on bilateral shoulders, left chest, and left arm (Figure 1B). Postinduction bone marrow biopsy showed acute myeloid leukemia M5b, FLT3-ITD positive with 35% cellularity and 21% blasts. A myeloid mutation panel showed PTPN11, SETBP1, U2AF1, and ZRSR2 mutations. The patient was then reinduced with 5+2 (cytarabine and idarubicin). His course was complicated by persistence of disease and infectious complications, and he ultimately passed away.